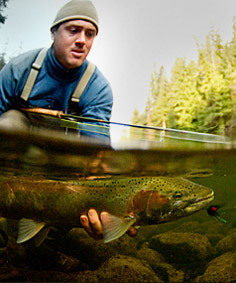 Tofino’s premium sportfishing specialist offers fully guided and outfitted saltwater and freshwater fishing excursions. All premium bait, tackle and fishing equipment are provided and packed picnic lunches can be arranged on advance request. Cleanline Sportfishing’s owner and head guide Blake Klopfenstein provides the right balance of local knowledge and passion for fishing with his years of experience on the water, and he’s always eager to teach everything he knows to those willing to learn. Blake’s passion for sportfishing started at a very early age, accompanying his father on patrols of Babine Lake in B.C.’s interior. With fishing pole in hand while his father conducted salmon surveys up various feeding tributaries, it was the streams teaming with hungry rainbow trout that kept 5 year old Blake occupied for hours on end! It didn’t take long for him to develop a keen interest in fly fishing, growing up in the Steelhead mecca of the world, Smithers B.C., fueling a new passion that would take him fishing all over the world. From many remote river and lake systems all over B.C. to Chile’s Patagonia, and after many winters spent abroad in tropical regions of Mexico, Central America, and Asia, Blake has honed his fishing skills in both salt and freshwater fishing techniques from around the world. Somewhere in between, after 5 years of university, Blake earned himself a Bachelor’s in surfing and a Master’s in fishing. And though he did also end up with a Bachelor’s of Science degree from the University of Victoria, specializing in geography and biology, his ‘ulterior motives’ behind choosing the Island location for his post-secondary education were always pretty obvious! Having spent the last 12 years on Vancouver Island fishing professionally, Blake now resides full time on its west coast in the town of Tofino, where he owns and operates Cleanline Sportfishing. If you would like to join Blake and experience what Cleanline has to offer, call us now to book at 1.855.726.3828. Cleanline Sportfishing is dedicated to providing the highest level of service and safety, while inspiring a passion for the fishing experience and maintaining an environmental consciousness to ensure the sustainability of future fish stocks.